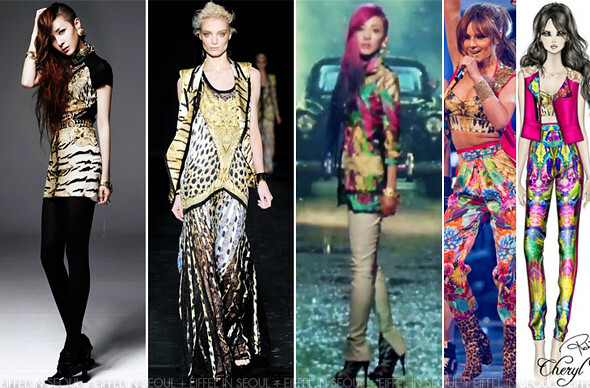 2NE1 is no stranger to fashion designer, Roberto Cavalli. 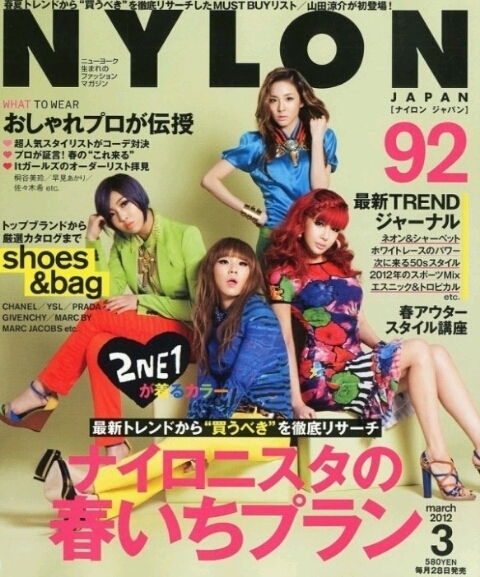 In their Nylon Japan March issue feature, they were seen wearing the designer's label through out the cover and editorial. In 'I Love You' promotional photos and music video, Sandara Park (박산다라) sports a leopard print blouse and tiger stripes skirt from Roberto Cavalli Spring/Summer 2012 collection. The modified pieces are styled with vintage Versace and Giza Tokyo accessories, black tights as well as Alexander Wang 'Cecilia' ankle boots. She sported a similar outerwear in 'I Love You' music video which Cheryl Cole wore to her performance at The Voice. Roberto Cavalli specially customized the outfit for the British singer. White Balmain denim, ankle boots, same vintage Versace and Giza Tokyo accessories to complete her look. I thought her leopard-tiger outfit was quite tacky but the neon-printed outfit was lovely. She looked incredible in it. What do you think? Don't forget to check out their music video below. They all looked bloody amazing in that video : D I love Dara's sidecut too! Hmm at least the panelling on the leopard print makes it less tacky. I think if it didn't have panels, it would look tackier. But I LOVED dara's look in the MV. scratch that, I thought all their outfits were just striking.